Vibrant Marrakech is perfectly situated between some of Morocco's most stunning sights, all well within reach for a memorable day trip. Whether you want to explore the Atlas Mountains, sunbathe on the Atlantic coast, or immerse yourself in traditional Berber culture, we've got plenty of ideas for one-day excursions from the city. Situated between a dramatic mountain landscape and the Atlantic coast, Marrakech is the ideal base for your Moroccan adventure. Once you've explored the city's attractions, like its colorful, labyrinthine souks and the lush Marjorelle Gardens, several thrilling excursions await you nearby. Away from the hustle and bustle of the city, you can really immerse yourself in Berber village culture amid the verdant valleys and snow-capped peaks of the High Atlas Mountains. 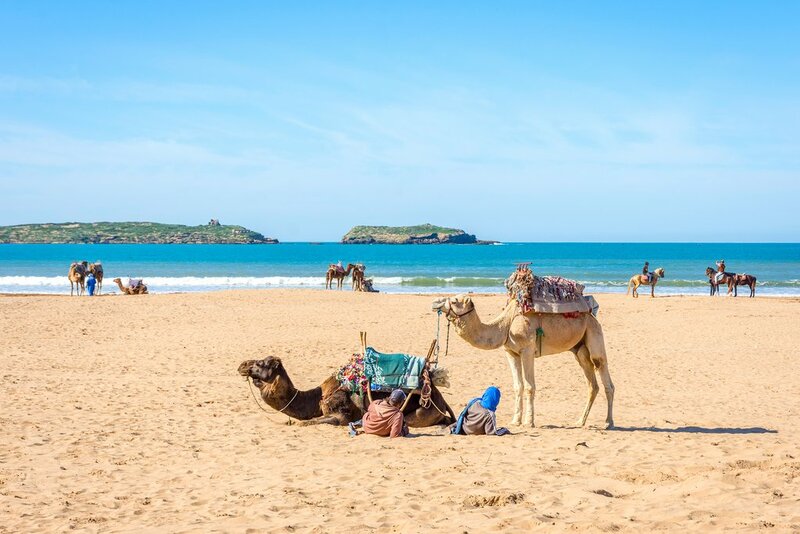 In the other direction, you'll find the ocean and lively Essaouira, where you can take part in a range of beach activities and enjoy the all the charms of a seaside town. 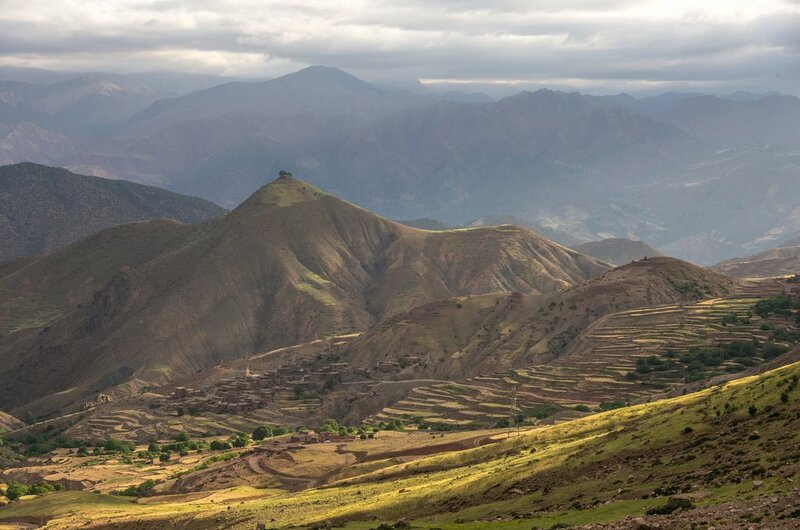 Just a short drive from Marrakech is the beautiful Imlil Valley in the High Atlas Mountains. It's home to several Berber villages and farms. The village of Imlil sits directly beneath Toubkal, Morocco's highest peak at 13,671 feet (4,167m). The lovely scenery and trail options around Toubkal make the Imlil Valley one of the best hiking regions in Morocco and a popular destination for locals and travelers alike. Plus, the crisp mountain air offers a refreshing break on days when the heat of Marrakech can be stifling. Set out from the city with your guide, driving south over the plains. The landscape changes dramatically as you enter the foothills of the Atlas, from large orange groves to small Berber villages. If you'd like, take time to stop in some of the villages to meet friendly locals and learn about their unique farming and crafting techniques. 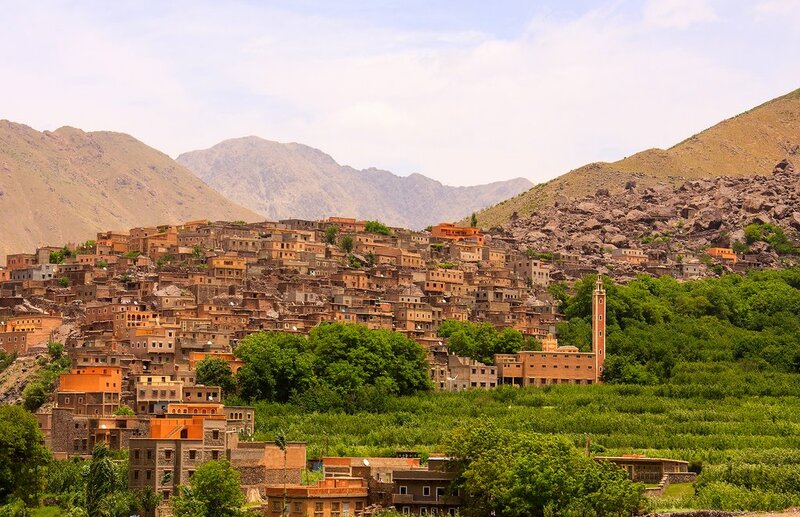 The village of Imlil itself is blessed with a dramatic High Atlas backdrop as well as lush fields of apple and walnut trees. Stop for a delectable lunch at the Toubkal Kasbah hotel. Set on a rocky outcrop, you'll enjoy spectacular panoramic views from every direction. Then spend the rest of the day exploring the village before driving back to Marrakech. If you're looking for a more hands-on cultural experience, make your way to the small traditional farming community of Douar Oulad Elguern on the Marrakech plains. Less than an hour outside the city, the village feels like a whole different world, with the Jbilat Hills to the north, and the High Atlas Mountains to the south. Here you'll find a unique opportunity to interact with the villagers informally and gain an understanding and appreciation for their traditional lifestyle. 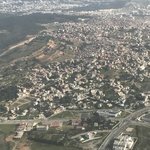 You can expect a very warm welcome from the locals here, who will offer you mint tea upon arrival as part of traditional Moroccan hospitality. Then you'll get an in-depth glimpse of rural life as you accompany them on their daily activities. You'll participate in a variety of tasks, like fetching water from the well, making earthen bricks, making charcoal, baking bread, or learning to cook couscous and tagine. After a hearty lunch (that you may have helped to make! ), spend the afternoon walking around the village with your local guides. You'll stop in at the primary school, artisanal workshops, and more. 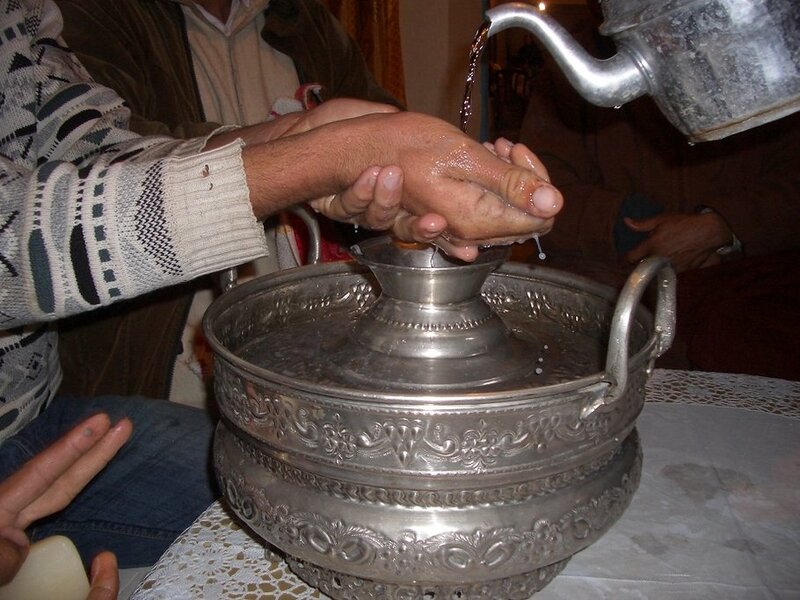 Immerse yourself in Berber traditions on this day trip to the village of Imozer, just two hours from Marrakech. Nestled deep in the Imozer Valley in the High Atlas Mountains, the village hasn't changed much in the past few centuries. The drive out is incredibly scenic, with dramatic peaks and sharp ridges towering above. In Imozer, the older buildings are made of pisé mud with flat roofs and small windows with attractive metalwork screens. After your welcome tea, you'll explore the village farmland with your local guides and learn how they grow their crops. Enjoy lunch in a traditional Berber salon, filled with colorful rugs and cushions. On your way back to Marrakech, you have the option to visit a salt extraction operation in the late spring and summer months. Go deep into the High Atlas Mountains today to places that few visitors ever see. 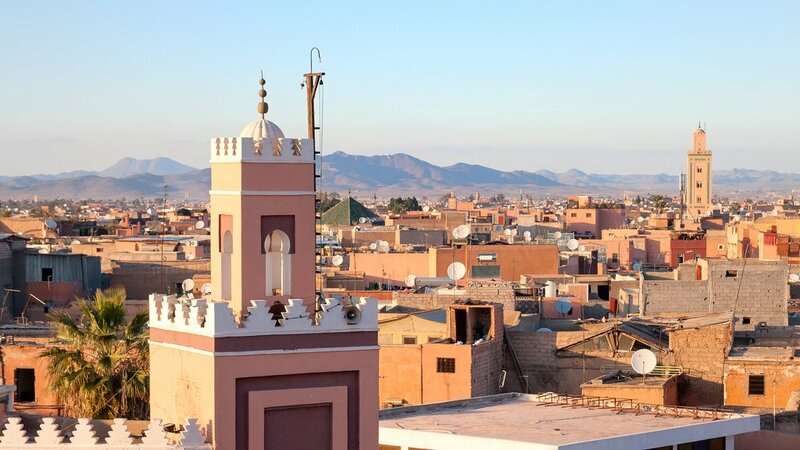 Drive south in a 4x4 on dirt roads across the Marrakech plains toward Amizmiz, a vibrant rural market town. Then travel through the Anogal Valley, where you'll see walnut and almond groves and terraced fields of vegetables, barley, and wheat. Enjoy the dramatic scenery of barren mountaintops contrasted with lush valley floors, and the sunbaked clay and stone houses of Berber villages nestled into the hilltops. When you reach the Azgour Valley, stop in at the weekly Berber market - it takes place on Mondays - and find colorful souvenirs and fresh snacks. 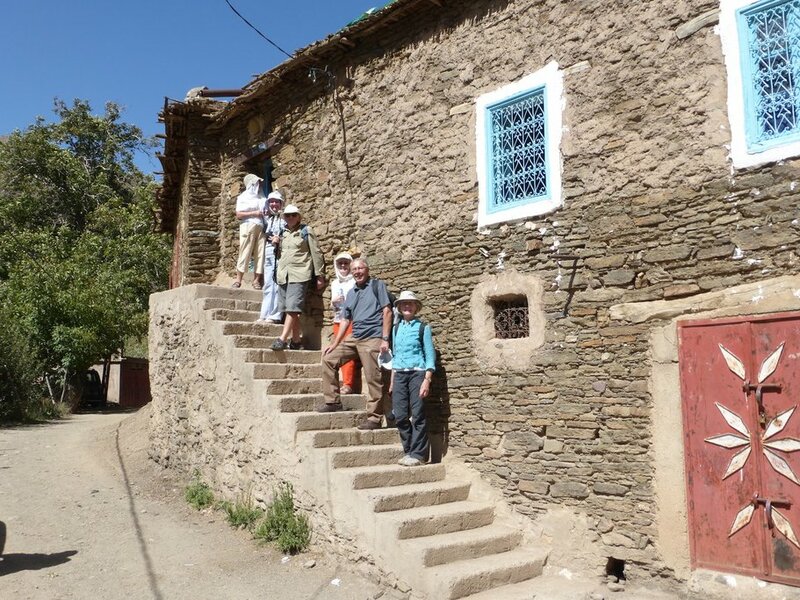 From there, continue to the Berber village of Adaghas at an altitude of 6,560 feet (2,000 m), where you'll have lunch in a traditional auberge, or inn. Take in the spectacular views of Toubkal and other High Atlas peaks as you enjoy your meal. After lunch, you'll drive to the village of Imi-n-Dounit, the most remote community you'll see today. Just a short walk away is the river's edge and a stunning gorge, nicknamed "Mouth of the Earth." Use the stepping stones and makeshift bridges to get through the gorge, reach a wonderfully serene spot where you can reflect upon your day. Just three hours west of Marrakech is Essaouira, a lively fishing port on the Atlantic Coast. Its pretty blue and white buildings and ocean breeze make for a refreshing getaway in the hotter months. On your way there you'll drive through an argan forest, trees unique to this part of Morocco and renowned worldwide for their oils used in cooking and cosmetics. Stop and see how rural farmers extract the oil from the seeds of the argan fruit. You'll see goats grazing on the trees, sometimes climbing up in the branches to reach the fruit! 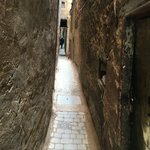 Once in Essaouira, stroll along the boardwalk, or roam around the narrow alleyways of the souks in the medina looking for treats and souvenirs. Visit the harbor to watch the fishermen bring in their catch, or simply sunbathe on the beach. If you'd like to do something a bit more active, there are also plenty of beach activities to take part in. You can ride horses or camels on the beach - and speed demons can rent an ATV for a thrilling coastal tour.